My guests and I really enjoyed this elegant version of macaroni and cheese. The creamy texture and richness made it extra special. It also went deliciously well with the ham I served and it's perfect just on its own. I adapted the original recipe by including garlic and onions to give it a bit more flavor. Maybe next time, I'll include some chicken to make it more of a one dish meal. 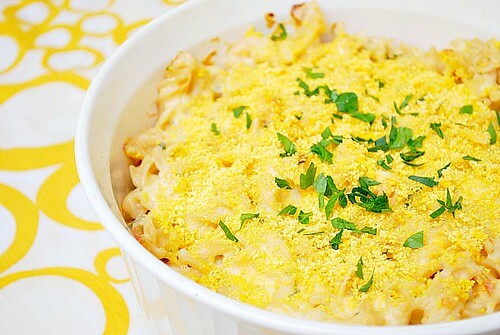 Have fun with this recipe... the traditional mac & cheese has gone gourmet! Preheat the oven to 350 degrees. Grease a 2 quart casserole dish with cooking spray or butter and set aside. Press SAUTE on the IP. Melt butter in IP; add garlic and onions, cooking until softened. Add the dry pasta, water, and butter into the IP. You'll notice no draining is necessary; the water will be absorbed by the pasta. Add half & half, Boursin, cheddar and parmesan cheeses and stir in until melted nd combined. Season with salt and pepper to your tastes. Transfer pasta to the greased casserole dish. Top with breadcrumbs and bake uncovered in the preheated oven. Bake for 5-10 minutes until bubbly and breadcrumbs crispy. Serve with chopped chives if desired.